Kittelsen painted and drew a great variety of views of Lake Soneren against Mount Andersnatten and the surrounding landscape, which included the series “Tirilil Tove”. New adventure series editions also kept him occupied during the Lauvlia years. A large number of solo exhibitions were held, mainly in Christiania. 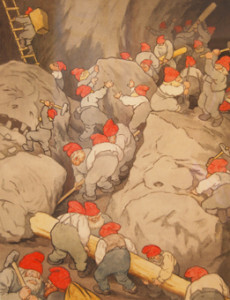 As early as 1905, Theodor Kittelsen’s health had begun to deteriorate. In 1907, he received the decorative commission “Fossens Eventyr” from Sam Eyde. In 1908 he was made Knight of the Royal Norwegian Order of St. Olav. In 1909, due to financial difficulties, the Kittelsen family were forced to sell Lauvlia.